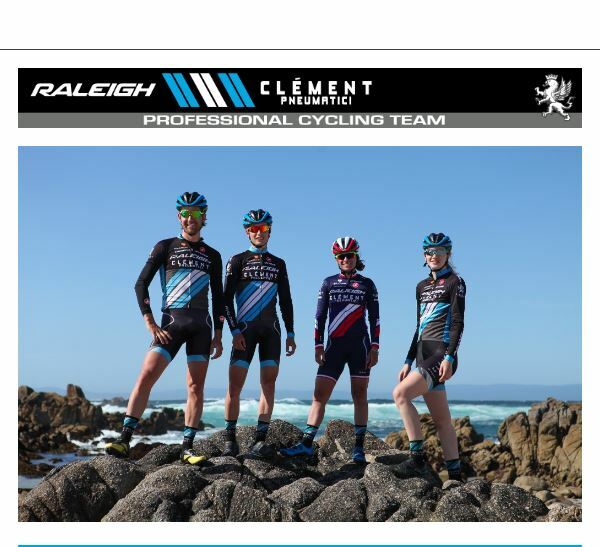 Two days out from the start of the 2016-17 cyclocross season, the Raleigh-Clement Professional Cycling Team is eager to get the season underway in Rochester, NY at the opening UCI weekend in the US. Caroline Mani, French National Champion and 2016 UCI World Championships silver medalist, and Jamey Driscoll, 2009 CrossVegas winner and eight-time UCI race winner in 2015-16, headline the team bringing years of experience and seasoned knowledge to the program. Development riders Lance Haidet, a regular finisher on the podium as a Junior and fourth place at the Pan American Championships as a first year U-23, and Laurel Rathbun, an 11-time national champion on the road, track and cyclocross, round out the powerhouse four-rider team. In three short years, Donn Kellogg, team owner and manager, has built a reputable and highly successful program as Raleigh-Clement has solidified itself as one of the dominant cyclocross teams on the domestic scene. The veteran riders of the program, Mani and Driscoll, have each won the USA Cycling Pro CX overall (2015 and 2016) twice, while the devo riders, Haidet and Rathbun, bring youthful exuberance and huge potential to the program. In the 2015-16 season alone, the four riders amassed over 40 wins and 75 top-five finishes. Moving into its fourth year, Raleigh-Clement will continue to aim for consistency with even better results. Although Raleigh-Clement is a US-based team, Mani and Haidet will add more European races to their busy US race schedule. After pocketing exceptional end-of-season results, Mani showed that she is capable of a high overall placing in the Telenet UCI World Cup series. With more UCI points in his back pocket to give him a better start position, Haidet will go to Europe looking to add valuable experience to his fledgling career. Driscoll, whose wife is expecting their first child in October, will anchor the US schedule and might make appearances in Europe in between diaper changing duties. Known for her fierce intensity and dramatic facial expressions, the 29-year old from Besançon had her best season to date in 2015-16. Mani, who has been with the team since it first opened its doors in 2013, finished last season ranked second in the world, notched her third French national cyclocross title and earned four top-five finishes at the Zolder, Namur, Lignières-en-Berry and Hoogerheide World Cups. Knocking on the door as one of the best in the world, Mani went on to score a silver medal at the UCI World Championships at the famous Circuit Zolder to bring the season to a close. Now that Mani has had a taste of being one of the best in the world, the Colorado Springs resident is keen to get back to Europe in an effort to further boost her palmarès. Driscoll, a mechanical engineer from Vermont who now resides in Park City, Utah, has been a professional cyclist and a steadfast competitor in cyclocross since 2008. In 2009 Driscoll picked up his most notable result when he won the prestigious CrossVegas. Since then the 29-year old has been a ubiquitous figure on the podium. In his third season with Raleigh-Clement, Driscoll scored eight UCI wins and 14 podium finishes to help him cinch the overall USA Cycling Pro CX series title for the second year in a row. With a new baby on the way, Driscoll won’t be making many trips across the pond with his teammates, but he fully intends to land himself on as many podiums as possible across the US. The youngest on the team at 18 years old, Haidet established his love of cycling from his dad growing up in Bend, Oregon and is now honing his cycling talent in San Luis Obispo, California. In 2014-15 Haidet tallied multiple wins and podium finishes as a Junior. As a first year U23 last season, the soft spoken and unassuming youngster fought his way from the back of the start grid to within striking distance of the podium against his U23 competition. Backing up his successful cyclocross season, Haidet racked up notable results on the road this past summer, often lining up as one of the youngest racers in the men’s Pro 1-2 field. Coming into the 2016-17 season as a second year U23 and a second year Raleigh-Clement member, Haidet is hoping to use what he learned last year to help him accumulate more points and accolades as the year unfolds. Rathbun, a Junior at Marian University in Indianapolis, started competing in triathlons when she was seven. Now a six-foot-tall model, Rathbun learned early that she did not love swimming and running, but she loved the bike. Since turning her attention solely to cycling, the 20-year old has garnered attention as a top collegiate cyclist in track, cyclocross and road. Her results in the women’s elite field earned her a spot on Team USA for the inaugural U23 Women’s Cyclocross World Championships in Zolder. While racing on the road with the United Health Care Professional Women’s Team at the Aviva Women’s Tour in the UK this summer, Rathbun suffered severe injuries in a crash that left her with numbness in her upper right arm. The brave and out-going young woman won’t be starting the cyclocross season, her second year with Raleigh-Clement, but is working hard to make a full recovery.